PHILADELPHIA, PA – The Federation of Hellenic American Societies of Philadelphia and Greater Delaware Valley presents the 198th Anniversary of Greek Independence with its Annual Greek Independence Day Parade on the Benjamin Franklin Parkway in Philadelphia, Sunday, April 7. Formation will start at 1 PM at 16th Street and Eakins Oval, and the official start of the parade will be 2 PM. It will end at the reviewing stand at Logan Circle. Participation of this historic event will include local, national, and international organizations. Representatives from the Republic of Hellas (Greece) government and military, the Greek Orthodox Archdiocese of America, folk dance troupes, local Greek Orthodox churches, cultural and educational organizations, will all take part at this historic event. An elite contingent of the Presidential Guard from Greece, known as the “Evzones,” who are trained to perform various ceremonial duties such as guarding the Tomb of the Unknown Soldier and the Presidential Mansion, will be participating. The Evzones are known for their distinctive uniform, which evolved from the clothes worn by the klephts who fought the Ottoman occupation of Greece. Their unique marching cadence and uniforms will bring a colorful and visual display to the historic Parkway, and the grandeur of the Evzones commands a great sense of pride for Greeks and guests. 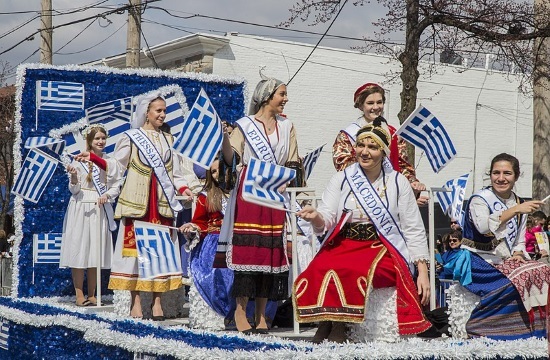 In addition to celebrating the 198th Anniversary of Greek Independence, this year’s parade theme holds special significance. The Federation will commemorate the 100th Anniversary of the Genocide of the Pontic Greeks. Under the Ottoman Empire the Greek community of the Black Sea was murdered and expelled from its homeland. One hundred woman dressed in black representing each the 100 years and various cultures from around the world will line the Parkway in memory of the lost homeland and people of Pontos. Finally, the prestigious Eleftheria Medal (Freedom medal) recipient and Grand Marshal, Consul General of Greece in New York Konstantinos Koutras, Honorary Parade Marshal Kyriakos Mossaides, and local Pontian Society Chapter “Akritai,” will lead the parade following the ceremony under the flag of Greece which stands along the Parkway. Following the parade procession that will conclude near the Art museum, a theatrical and musical dance will close the parade commemorating the historic day.